Netra Bikran Chand ‘Biplav’-led breakaway faction of the CPN-Maoist Monday announced the official formation of a new party Communist Party of Nepal Maoist. Organising a press conference in Kathmandu on Monday, December 1, 2014, the newly formed party urged the ruling coalition parties to implement in full the 12-point understanding, the interim constitution and the Comprehensive Peace Agreement. We are sending this letter at a time when the sun of revolution in Nepal has already gone down long before. The people’s war that was earth shaking event in contemporary world that even after liberating eighty percent areas of the country has collapsed because of the betrayal line of the leaders, and as a consequence, all the achievements were lost. Now there is no People’s War, no Liberated Areas and no People’s Liberation Army. There is no hope remaining except the people. Besides, there are many sincere revolution seeking leaders and cadres who generally exist in every country as a result of revolutionary process. The former Communist Party of Nepal (Maoist)-being a member of Revolutionary Internationalist Movement rose against Maoism, abandoned the Path of Revolution, disarmed people and dismantled Base Areas. RIM committee hided those betrayal, advocated a secret Two Lines struggle, upheld coexistence with opportunism and adopted an incorrect method of restricting Line Struggle, and thus RIM committee resigned leading role of RIM. By presenting ideology as ’ Maoism or Mao thought’, led by Prachanda-Baburam the revisionists transformed Communist party of Nepal (Maoist) to Unified communist party of Nepal (Maoist). It was final rejection of Maoism. Prachanda-Baburam revisionists showed that present world and domestic situation is not favorable for revolution, so, compromise should be made. They said of so called bourgeoisie democracy instead of New Democracy. Through the so called peace talk, they made People’s Liberation Army surrender to reactionary army, and by surrendering achieved land and power to the exploiters, became imperialist- expansionists’ lackey the fascist Bureaucratic Bourgeoisie. On the other side, Revolutionary Communist Party, USA also made leap to their own revisionism. Both CPN (Maoist) and RCP USA, seeing only the outer appearance of globalized named imperialist world, and not by seeing its contradictory and moribund essence, presented it as unipolar and showed that war or revolution is not inevitable. They declared Marxism as insufficient. Both of them abandoned the concept of Proletarian Dictatorship that is a basic tenet of Marxism. Even RCP branded the confidence on Marxist Philosophy as Political Truth and hoisted the flag of non-Political Truth. Nepal: CPN (Maoist) to add paramilitary force to post-PW “revolt” plan? CPN-Maoist leaders gathered for the ongoing Central Committee (CC) meeting in Pokhara have stressed the need for forming a paramilitary force comprising the former People’s Liberation Army fighters, youths, workers and students. Commenting on the party leadership’s proposal to start a fresh people’s revolt, around 110 leaders have suggested the party leadership that the revolt cannot be accomplished without such a force. The newly-formed CPN-Maoist party has recently convened its seventh general convention which decided on ´people´s revolt´ as the party´s political line. The convention also elected a 51-member central committee under the chairmanship of Mohan Baidya. You have been elected party head again after 28 years. How do you feel –is there something new or difference, as you have been elected both times during critical periods? I was elected a central committee member at four general conventions and I was elected party general secretary at the fifth national congress in 2041. So, I no longer feel any desire for assuming the main leadership post. I now see very high hills of challenge, challenge for the people and the country. The question is how to move forward facing these negative and positive challenges. I am now in such a place where both renown as a revolutionary as well ill fame are possible. And I remember a quote from Comrade Mao, that people can fall very far down after reaching very high. I can go on facing the challenges if I get the help of party cadres and the people. The question is how can I accommodate the line of the masses and the interests of the people. Although you were elected both times in very critical circumstances do you feel any difference between the two occasions? I have always been for the idealist way of revolution. I thought Prachand was also for this. I had thought that I would not again assume the main leadership of the party after the arrival of Prachand in the party´s main leadership. I came into the main leadership unexpectedly. But this was natural, as such things can happen if necessary. Is it easier to be a leader or to make a leader? It is a very difficult thing to understand human beings. Prachand was not such a person and how he has changed. We do not know how human beings change. It is a very difficult thing. You also mentioned that it was a mistake to hand over leadership to Prachand. Why? UCPN (Maoist) leaders say that there is in the main no difference between the two Maoist parties. After the general convention, would you say there are differences? There are various differences. We follow the new democratic revolution but they have left that path. We talk about national sovereignty but they have abandoned it. We have been saying the constitution should assure the rights of women, dalits and ethnic groups. But they have abandoned that also. UCPN (Maoist) is converting itself into a party of the elite classes but we are trying to make ours a party of the proletariat. Maoist leaders allege that Hindi movies create hatred against Nepal. The Maoists have succeeded in preventing the supply of Bollywood films to Nepal after blocking all traffic via Maharajganj in Uttar Pradesh. 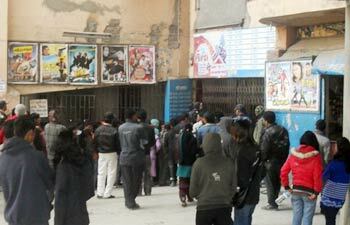 As a result, there is no cinema hall in Nepal showing a Hindi film at present. The Communist Party of Nepal (Maoist), a radical faction of the ruling Unified Communist Party of Nepal (Maoist), led by Mohan Kiran Vaidya had threatened last week that supporters would attack cinema halls if they continued screening Hindi films. Simultaneously, several Maoist groups owing allegiance to Vaidya established their camps in Nepal’s border area of Bhairahwan near Nautanwa in Maharajganj on the UP side and stopped all vehicles from plying between the two countries. Vaidya had alleged that Hindi movies created hatred against Nepal. “They show Nepalis as servants only and portray us in bad light,” he said.